Who is guilty of misusing science? I know someone is going to accuse me of “scientism” for this. But I guess that goes with the science blogger’s job – and it’s a diversion anyway. It will hardly be the first time. 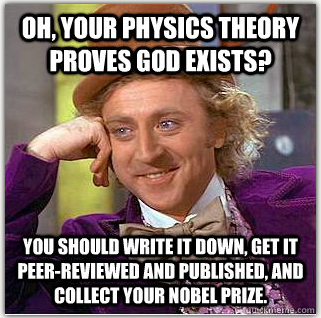 Credit: Does God Exist Scientifically? Now, I have no problem with private belief. And many people no doubt retain this “limits of science” argument as part of their private belief. We all have beliefs or quirks which we don’t feel the need, or wish, to expose to critical investigation. That’s fine by me. But I do object to those religious apologists who make this “limits of science” claim, but at the same time resort to arguments from scientific knowledge, or even just from reasoning, to claim their god belief is completely justifiable, and that my god disbelief is not. You, know – those who prattle on about “fine-tuning” of physical and cosmological constants, of evidence for an origin of the universe as “proof” of the existence of their god! Even those who claim the facts of “moral truths” prove their god! And then go on to rule “out of order” scientific arguments used by those who don’t believe. I think both claims are unjustified – they are just emotionally motivated “logic” arguing for, and protecting, a preconceived belief. The scientific proof of the religious apologist amounts to nothing more than weak claims that “the evidence of an Intelligent Designer is all around us.” Or that scientific explanations of life and the universe have huge gaps. That somehow when a scientist says “I don’t know” this “proves” the religionist’s myth-based belief must be true – bugger the need for evidence or validation of ideas. That’s not scientific proof! You need to do a lot more than just badmouth scientific theories. In science you actually need to advance a structured hypothesis. One based on evidence that makes predictions which can be tested against reality. Hypotheses and ideas that stand up to scrutiny, are open to modification, even outright abandonment, in the light of evidence. You know, the sort of science which leads to publications and conference presentations. As for the “limits of science” argument – this is never properly justified. If their god is part of objectively existing reality then surely the scientific approach is an acceptable way of investigating the claim. Of course science may not be up to that job. There are certainly areas which it finds difficult to investigate now – and there are potentially areas we may never be able to investigate because of limits in our technology and our intelligence. But at the moment the scientific approach is the best one we have to investigate difficult aspects of reality. And if science cannot sort things out then no-one has yet been able to produce an alternative, a specific “other way of knowing,” which could do the job – have they? Yes, I know, these Sophisticated TheologiansTM have some clever arguments. Their god is outside space and time. Outside the universe. Therefore we have no way of investigating it. No way of detecting it even. The obvious question that comes to my mind is “How do you know that? You seems to be so certain – what evidence do you have.” And isn’t this another one rule for me, another for you argument? After all – you claim that god is answering your prayers, influencing events in the world, helping believers win races and overcome illness. Even causing a few hurricanes or earthquakes to discipline us for sinning! Going in for a bit of smiting! If that is the case your god is leaving an evidential trail which science can investigate. But if you god is truly outside time and space, outside the universe, not only would we not be able to detect it, it would not have any influence here – would it? Haven’t you gone overboard in your attempt to protect your god from scientific investigation. You have ended up in defining your god out of any practical existence! So before you start chanting “scientism” – ask yourself who is guilty of scientism? Of using science inappropriately? Surely it is the religious apologist who claims “scientific proof” which is not at all scientific. Or who claims they know things about reality which they cannot possibly know. That they have an alternative “way of knowing” which can produce Truth with a capital T – but which they cannot even describe.